available from Frontline. Good video games encourage students to make mistakes,good video games give immediate feedback. On the other hand, they divorce kids from solving real world problems and tamper with realistic expectations about the nature of solving difficult problems. 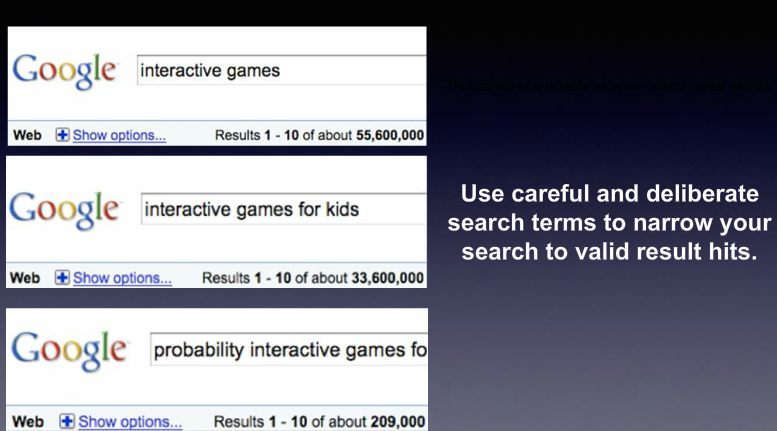 How to find short web-based games - Search for specific content games, for example click here. Free online version of The Art of Game Design, by Chris Crawford. Crawford is a master game designer and deep thinker. His insights have remarkable connections to designing optimal environments and experiences for learning. Teens, Video Games, and Civics: Teens’ gaming experiences are diverse, and include significant social interaction and civic engagement. Washington, DC: Pew Internet & American Life Project, September 16, 2008. Does Easy Do It? Children, Games, and Learning by Seymour Papert, From the June 1998 issue of Game Developer magazine, "Soapbox" section, page 88. Also included is a letter in response to Papert's article and Papert's response to that letter, both of which appeared in the September 1998 issue of the magazine.